I stopped by Cory Pope's much-talked about new showroom in the International yesterday, and although it's still weeks away from actually opening -- Pope says February 16 now -- enough was happening inside to get me really jazzed. While I was there, workers were busy hanging yards of extraordinary textiles by Swiss company Jakob Schlaepfer from the ceiling. Pope's showroom is the first in the U.S. to carry the unusual line, he says. 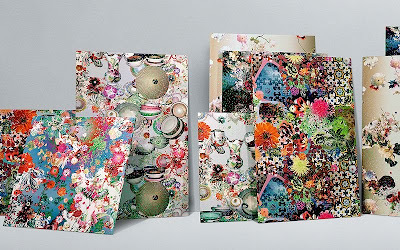 I went nuts when I saw these fabrics. Photos don't do them justice, and you'll need to go experience them yourself at the showroom. Some of the images from Schlaepfer evidently wouldn't translate properly to my American MacBook Pro, and I wish I could show you everything. But I can't, and you'll have to see a smattering here. 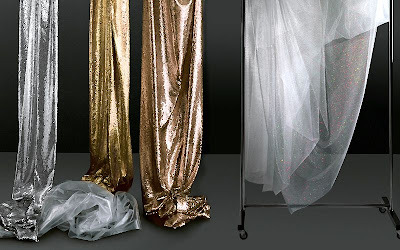 Below, a curtain material created from embossed gold, silver or copper-colored sequins that are stitched to overlap, creating the effect of chased metal (first three fabrics to the left). 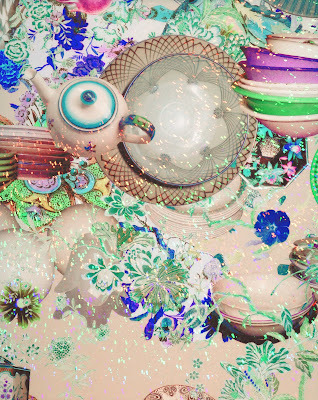 Jakob Schlaepfer creates an astonishing, optic and multi-dimensional effect by entirely embroidering a patterned fabric (such as the one at right above) with transparent sequins, in a mind-boggling display of detail. If you did this, as someone surely must have by hand, you'd go blind. 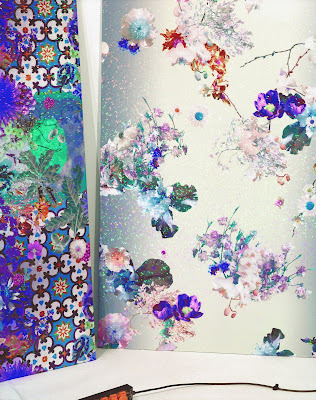 This wallcovering, called Glinka, is made of bonded holographic foil. The colors refused to translate on my computer and here they look garish and not so pretty, but if you click on the image you can see a bit of the holographic effect, which is many times more dramatic in person. I'm usually not into such busy looking wallpapers, but I'd buy a yard of it and frame it, it's that amazing. At about $600 net, it's totally doable. More Glinka holographic wall coverings above and below. Again, these colors just don't look right to me. In person they're elegantly abrasive, if you know what I mean. 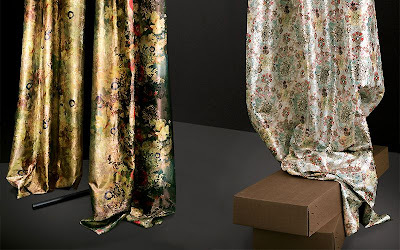 What you don't see here, but you should ask to see when you go in, are the printed tulles, which consist of three layers of tulle printed simultaneously with modern, abstracted flowers. 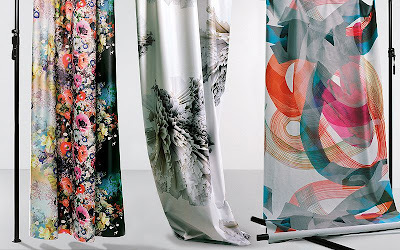 The layers give the fabric a 3-D look, and the company says no one has ever successfully printed onto so many layers at once. I don't know about that, but they really are cool.